economic development in the capital region of Kansas. Forbes Field, Central Crossing Commerce Park and Kanza Fire Commerce Park serve as the main anchors of the Kanza Economic Growth Complex on the south side of Topeka. an an "untapped jewel" unlock corporate development riches for Topeka? A number of prominent site selection consultants think so, and now the capital city of Kansas is taking proactive measures to tap that prized resource. That resource is the Kanza Economic Growth Complex, a south Topeka area anchored by a trifecta of development-ready sites: the Kanza Fire Commerce Park, the Central Crossing Commerce Park and Forbes Field. Connected by Highway 75 and a BNSF Railway line and close to Interstate 335 and Interstate 70, the three sites represent the industrial infrastructure of future economic growth in Shawnee County. Already home to industrial facilities for Home Depot, Target, Frito-Lay and Bimbo/Allen Foods, the Kanza Economic Growth Complex (KEGC) is the focal point of economic development recruiting for GO Topeka Economic Partnership. Steve Briman, chairman of the GO Topeka Economic Partnership, says that the KEGC "has all of the assets that make this area ripe for development." Briman says the Kanza Fire Commerce Park was the result of a feasibility study that assessed local transportation networks and industrial infrastructure for the purpose of identifying sites suitable for industrial development. "GO Topeka was very forward thinking when it commissioned this study," says Briman. "Bartlett & West was employed to do a study of potential areas around our community, and as a result we are now in the process of developing the Kanza Park, which has more than 1,000 acres of shovel-ready sites for building." The nearby Central Crossing Commerce Park is nearly full, notes Briman, leaving Kanza Park and Forbes Field as the next most likely options for future construction. A former Air Force Base, Forbes Field has a 12,800-foot-by-200-foot runway, making the airport very attractive to commercial aviation and aerospace companies, adds Briman. "Our study showed that Forbes is one of only six or seven air fields in the country that has a runway this long and is still under capacity," he says. "We have the potential of aviation manufacturing and other possibilities. We will embark on adding more definition to the master plan for Forbes Field, but we are ready for some big scores." Some national site consultants echo those comments as well. Amy Holloway, president of Avalanche Consulting Inc. in Austin, Texas, says her firm spent about five months evaluating Topeka and the entire nine-county region and delivered a study on the area in December. A healthy mix of strong private employers including Goodyear, Frito-Lay, Hill’s, Hallmark, Target, Home Depot and Del Monte. A logistics-friendly geographic location with excellent rail and highway connections, plus close proximity to an international airport and regional hub in Kansas City. Access to a population base of more than 500,000 people in Shawnee County and the neighboring eight counties. Close proximity to Kansas State University in Manhattan, the University of Kansas in Lawrence, Washburn University in Topeka, Washburn Institute of Technology, Manhattan Area Technical College and Emporia State University. The IMPACT program of KansasWorks, which provides a $2,000 job training incentive to employers investing in training and equipment. The strong work ethic of the labor force in the region. "What really stands out about Topeka is that it is a real value for companies," says Holloway. "The area has a very high quality of life but is also very affordable. The state of Kansas has an incredibly strong public school system and technical college system, and both are very important for site selection decisions." Available sites will be critical for securing corporate employers, she adds. "Forbes Field is a world-class asset with a great runway. There are very few runways of that length in the whole country," she says. "The area is also ripe for spinoff activity from university research and development at the many colleges and universities in the region." Target industries for the region, she says, include food processing, bio-medical firms, logistics, clean-technology firms and back-office operations. "There are also sub-sectors within each of these industries," Holloway says. 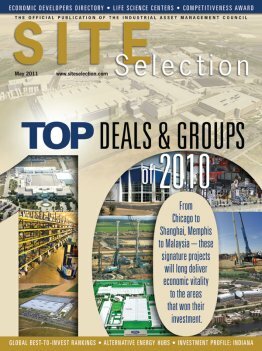 "Animal research, frozen foods, financial services, data centers, warehousing, rail logistics and airpark development are all excellent fits for Topeka." Holloway adds that she is "impressed with the leadership at the local level. They have the right people at the table, and strong economic development initiatives are led by the private sector. All they have to do now is get on the radar screen of site selectors." Ed McCallum, principal of McCallum Sweeney Consulting in Greenville, S.C., concurs. "Topeka has been very aggressive on just about every project we have worked on in this part of the country," he says. "They are thinking regionally and that is very important, and they are being aggressive with incentives." Forbes Field and Kanza Park represent great opportunities for future development, McCallum notes. "They are smack dab in the center of the country, and they are largely undeveloped," he says. "Most airports that we look at have so much development there already that they require environmental remediation. There is no such limitation at either Forbes Field or Kanza." Aerospace firms and renewable energy companies would both be a good fit for the Greater Topeka area, McCallum says. "The airport is an untapped jewel. They are taking a good hard look at their assets, and right now that area is kind of an open book. I think it is one of those places that make it an early positioning community. It is an exciting opportunity for the right kind of company." Briman says the right firms will come once the word gets out. "We are marketing our assets fairly effectively," he says. "We have not done enough to brand our region, but we are working on that through the GO Topeka organization. Right now, the people in our community are all focused on making Topeka better. They are willing to roll up their sleeves, apply elbow grease and volunteer their time." Those efforts are paying off, he notes. "The Home Depot Rapid Deployment Center project was announced here in 2009 right in the middle of the recession, and we had Allen Foods announce a facility project here in 2010. Both of them built plants in the Central Crossing Commerce Park," he adds. "With results like these, we are very encouraged." This investment profile was prepared under the auspices of GO Topeka, a division of the Greater Topeka Chamber of Commerce. For more information visit www.GoTopeka.com or call Steve Jenkins at (785) 234-2644.